The estate, located in the fertile and charming Valdichiana, just half-way between Arezzo and Cortona, has been owned for centuries by the Sandrelli family, an ancient and noble family from the land of Arezzo already well known as early as in the 14th century. The Sandrelli family, linked to illustrious Tuscan and Arezzo families amongst which close family bonds were maintained with the De Bacci family, the family that commissioned the world-famous frescoes by Piero della Francesca in the church of San Francesco in Arezzo, were and still are deeply linked to their territory and its history reflecting a heartfelt respect for the coutry-side and its activities and a profound love for arts as is a consolidated tradition for this family and this land. The serene amenity of the place is made more precious by the scent of a past background that keeps untouched the taste of past times and things, suavely gratified by the gratefulness of nature for the work spent in the slow unfolding of history. We should remember the work of Raffaello Sandrelli (1834 – 1912), bishop of Sansepolcro, whose loving care in the decoration of the local 18th century charming church of S.Martino goes to show the great sensibility marking the gestures and intentions of entire families and generations. The estate, the throbbing heart of a larger farm, dipped in the lively and quiet coutryside, is arranged around a buidling complex having at its centre the 18th century villa and its garden. 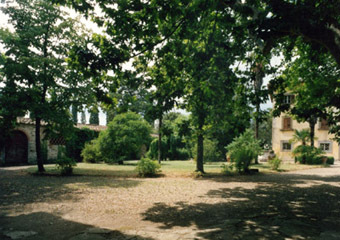 The complex originated from the combination of century-old houses shows the typical structure of a Tuscan farm where the main building is not located at some distance from the working facilities located around it but stands on the contrary in close proximity to them and serves as the coordinating centre doubling up as dwelling unit and the heart of all working activities. The main body of the master’s villa extends to include those that once were the farmers’ houses, today an integral part of the estate and the houses belonging to those carrying out all different activities within the farm. The beautiful garden overlooked by the villa featuring century-old trees, sweet-smelling wisterias and colourful flowers perfectly matches the stonework of the old barns, the old baking oven, the old stables enclosing its perimeter; the latter were recently converted into a nice-looking open loggiato and make the garden seem to run endlessly into the large lawns (once the barnyard) framed by a beautiful cypress tree-lined path and housing the estate’s swimming-pool. Right next to the villa, only separated by the road running along the route of an ancient Roman road, stands the family chapel onto which leans the lemon-house with its charming Italian-style garden, its vegetable garden and the lemon-garden with its imposing century-old oak-tree, a sort of hortus conclusus framed by the nearby mountains bounding the valley.